Where are you going to keep this pup?" a question thatis often asked by the breeder when purchasing a pup. 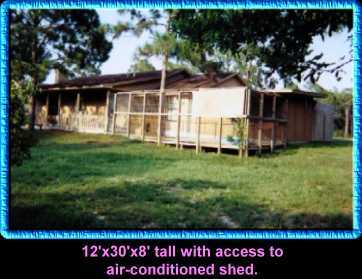 Every reputable breeder would love for their animals togo to a place where they could have lots of acres to run. 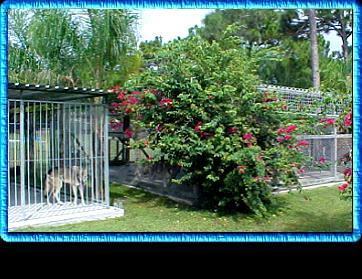 these photos, you will see some ideas for housing, containment and entertainment for your wolfdogs. There are many forms of containment. The following are just a few. 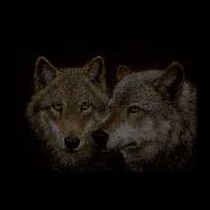 Many more may been seen by checking with wolfdunn. 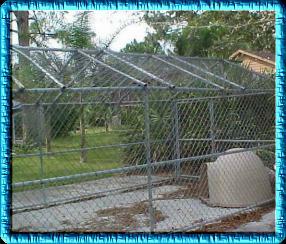 to provide shade as well as give your kennel a look you can be proud of. 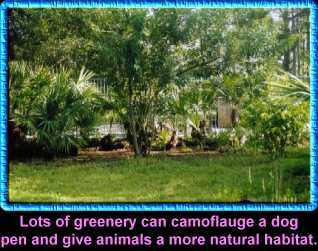 However don't plant to close or your animal may not give anything a chance to grow. They think every thing is edible you know ! 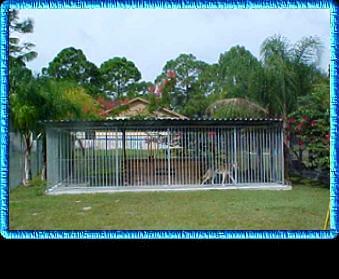 This is a kennel that can be used to hold any escape artist until a bigger enclosure can be built. 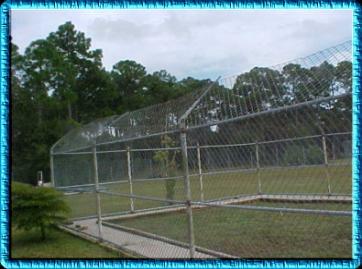 It is made with 9 gauge chain link and is wired and welded at the top. 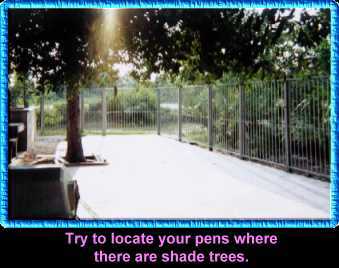 Palm leaves or tarps can be added to the top for shade. 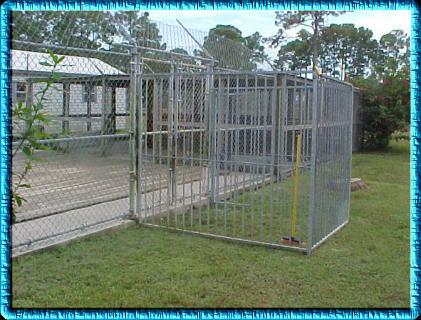 It is a good feeling to put an animal who has been given up by their owner into this kennel and walk away knowing that the animal will be there safe and sound when you return. When building containment for your animal do it right the first time . It saves time, money and heartache. We will be glad to help with any containment problems you may have. 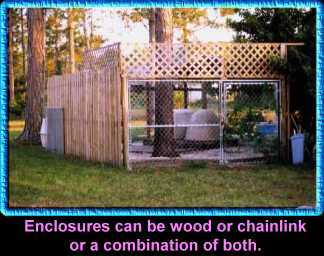 Remember ALL animals can be contained. If you can't contain them you're not smart enough to own them. I don't mean that to be disrespectful to anyone, but containment is all part of the package and it really is not that difficult. 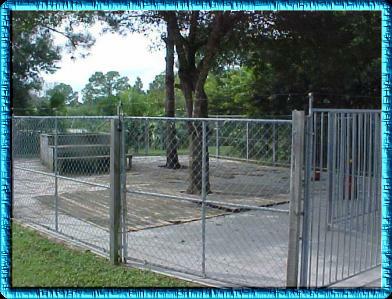 Most animals that come into rescue do so because their owners could not keep them contained. 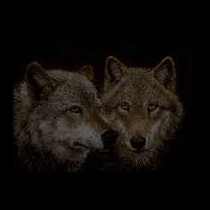 For every problem you can have with these animals there is a solution other than giving them up. Please call us for advice, we would be only to glad to help. method for those who can ignore the hotwire. 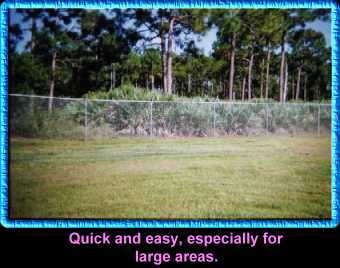 Double entries are good to prevent animals from slipping past you as you enter their enclosure. 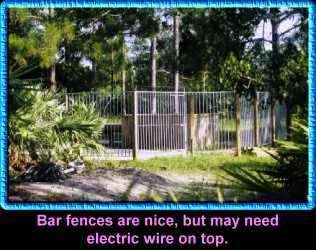 They are especially good if your entire perimeter is not fenced. Concrete skirting keeps diggers in and the angle of 45 degrees at the top foils every attempt to jump or climb. of work but is well worth it. 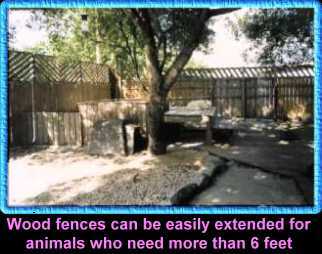 The animals in this enclosure are quite happy and never even attempt to leave. 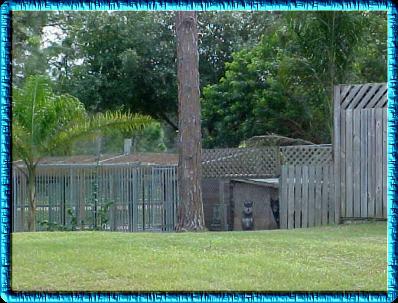 Animals like a nice environment with a view of what's going on.